What’s With All These Prison Art and Photography Exhibitions? Camilo Cruz, Untitled from the Portraits of Purpose series, 56 x 45 inches. Courtesy of the artist. Of course, I’m being provocative, but the rise and rise of prison criticism and reflection (and commodification) in the cultural sphere bears consideration. Here is not an exhaustive list but a few examples — Life After Death and Elsewhere, curated by Robin Paris and Tom Williams at apexart; To Shoot A Kite curated by Yaelle Amir at the CUE Foundation; Voices Of Incarceration at Loyola Marymount University in Los Angeles; Try Youth As Youth curated by Meg Noe at David Weinberg in Chicago; Site Unseen: Incarceration curated by Sheila Pinkel; The Cell and the Sanctuary put on by the William James Association in Santa Cruz, CA; and my own Prison Obscura. This weekend, Inside/Outside: Prison Narratives will end its 10-week run at the Wignall Museum of Contemporary Art at Chaffey College in Southern California. Inside/Outside is a relatively large survey of prisoner art, prison photography and visual activism that brings together the work of Sandow Birk, Camilo Cruz, Amy Elkins, Alyse Emdur, Ashley Hunt, Spencer Lowell, Los Angeles Poverty Department (LAPD), Jason Metcalf, Sheila Pinkel, Richard Ross, Kristen S. Wilkins, Steve Shoffner, the Counter Narrative Society and students at the California Institute for Women. As many of the names in Inside/Outside: Prison Narratives are familiar, I felt a review by me would be redundant; it’d be dominated by applause to the committed artists I see as asking the right questions … because they’re the questions I’ve ask too. Instead, I wanted to focus on the recent uptick in fine art exhibitions orbiting the issues of prisons. Rebecca Trawick, Director of the Wignall Museum and co-curator of Inside/Outside and I were in touch a while before I realised that this should be what we should discuss. And how the cultural production of art around, and about, the prison industrial complex propels, inspires, derails (and much else besides) dialogue about mass incarceration in America. Kindly, Trawick and her co-curator, Misty Burruel, Associate Professor of Art at Chaffey College accepted my invite to answer some questions. The Q&A is peppered with artworks from Inside/Outside: Prison Narratives. Scroll down for our discussion. Camilo Cruz, Untitled from the Theater of Souls series, 56 x 45 inches. Courtesy of the artist. Prison Photography (PP): Why did you make this exhibition? Rebecca Trawick (RT): Incarceration was an issue that I kept returning to in my research. As a curator, I’m specifically interested in shedding light on important but difficult social issues through the lens of contemporary art. I love how artists can take an unwieldly topic and consider it thoughtfully, often personally, and in really compelling ways that allow the viewer a chance at transformation, or expansion of, thought and perspective. Because we work at an institution of higher education, these exhibitions become a safe space to start difficult discussions about issues such as incarceration, and they become a tool to educate and inform. This kind of exhibition (if done well) can demonstrate the value of art to transform ideas, minds, and communities. Misty Burruel (MB): Because it was a challenge. On the heels of a number of incarceration exhibitions in southern California that focused on works by incarcerated artists and artists confronting the criminal justice system, it was appropriate to look at it through the lens of education. We are confronted daily with students that have either been incarcerated or have family who are incarcerated. It was time to have difficult discussions about the role of education in the penal system, our responsibility as citizens to each other, and how parolees reintegrate into yet another system. PP: Is incarceration a “hot topic” right now? Why? RT: As Misty and I mention in our remarks in the printed takeaway, we seem to be experiencing a unique convergence of policy discussions in the US as well as popular culture interests, so we feel like the conversation is already happening in certain circles. We hope our exhibition helps to expand the discussion and dig a little deeper into some of the topics looked at in contemporary documentary (think the recent Vice episode, Fixing the System, in which President Obama – the first sitting US President to do so – visited a federal prison) to the popularity of Orange is the New Black. MB: Jenji Kohan’s, Orange is the New Black, portrayal of incarcerated women created a splash on Netflix and revealed through mass media the complexities of a system within a system. The women were all too real and relatable. We live in the Inland Empire and have two prisons at our footstep. PP: California Institute for Men and California Institute for Women. Jason Metcalf, Cheeseburger, French Fries, Iced Tea (Dwight Adanandus), 2013, archival pigment print, 16 x 24 inches. Courtesy of the artist. PP: Is Inside/Outside about incarceration or is it about the representation of incarceration? RT: The exhibition is about the many issues surrounding incarceration that we hope our viewers will consider more deeply after viewing the work on view. Issues include the value of rehabilitation behind bars; juveniles in justice; death penalty, segregation, prison labor, and isolation as systems of control, among others. PP: How did you select the artists? RT: The Wignall Museum mainly draws from Southern California for practical reasons–funding limits us to local pickups mainly. In some cases (Kristin S. Wilkins, for example) agreed to ship the work to us so we were able to include her. We’re often limited regionally, which explains the SoCal bias. We would have loved to include works outside our region, if possible. (see next question for a list of some we would have included if possible.) The one thing I remind myself is that we’re not trying to be essentialist in what we portray or explore, but rather offer some really amazing work to assist us in digging a little deeper into the state of incarceration today. MB: We are in a human warehousing gridlock. The works collectively focus on how the system of control does not discriminate (women, men, and youth detention). PP: Were there any artists or works out there that you’d wanted in the show but couldn’t for whatever reason? RT: Yes! Many. The list includes Deborah Luster, Dread Scott, Jackie Sumell’s The House That Herman Built, and Julie Green’s Last Supper installation all immediately come to mind. There were many others, but those three stand out for me. MB: We wanted to have more guest speakers, but funding always seems to be a hurdle. We can certainly look at the issue, but we really wanted to talk about it. PP: Really? From the outside that you had a phenomenal amount of programming. I applaud you. How important was programing around the exhibition? RT: Programming is critical. Because we’re limited in many ways in terms of what we can show – due to spatial and fiscal restrictions – programming allows us to bring in experts in the field to further contextualize and expand the themes of the exhibition. It also allows community engagement and for other voices to join in the conversation, often in a public forum. That ability can’t be underestimated, I think. MB: When the discussing an exhibition about incarceration we were most focused on programming. Rebecca and I are collaborative by nature and we were able to find others who were very interested in asking difficult questions within their own disciplines (Sociology, Philosophy, Correctional Science, Administration of Justice). PP: I’ve been asked a number of times “Who are you (a white, cis-gender, male, college graduate) to speak to these issues?” Every time by a highschooler — God, I love them. Were you ever challenged over your role and/or position while putting Inside/Outside: Prison Narratives together? RT: As a curator at an institution situated on the campus of a Community College I feel strongly that it is our responsibility to explore a wide array of topics in our exhibitions and to look from a place of diversity – diversity of media, content, viewpoint, race, ethnicity, etc. – and through the lens of contemporary art, but it is critical that we do so in a way that is thoughtful and multifaceted. Philosophically we try to schedule our exhibitions and programs in a way that expand outside of our own limited perspectives. We also try to use multiple guest voices – guest curators, guest speakers, etc. to expand the discourse around an exhibition. But the long and the short of it is, I try to always be conscious of my privilege and to present diverse voices. That said, my own experience/perspective was never called into question during the exhibition planning or implementation phase. MB: The college has wholeheartedly embraced the exhibition and its programming. Amy Elkins. 26/44 (Not the Man I Once Was), 2011. Portrait of a man twenty-six years into his death row sentence where the ratio of years spent in prison to years alive determined the level of image loss. You’ve said the response so far has been positive. More than other Wignall shows? More among the student body, or beyond? How do you measure response/success? RT: This exhibition definitely has seemed to link to something that is personal and relatable for many of our students, faculty and community visitors, evident by the verbal responses and reactions we’ve seen in the galleries. We’ve held a number of panel discussions, engagement activities, a film screening, and dozens of tours. Unequivocally, discussions always seem to lead to the personal and comments suggest that the ability to discuss a somewhat taboo topic has been relevant. MB: This work is incredibly personal and relevant to the Inland Empire. PP: Can you see the successes and failures of the show already? Or is it too soon for that type of assessment? RT: Success can be measured in qualitative and quantitative ways … (as of course, can failure). Due to the high level of programming, and the sheer number of student tours we’ve conducted, we can see an increased level of engagement. Our visitor numbers are up, the number of students speaking up during tours has increased a great deal, and the unsolicited feedback from students/faculty/staff we’re getting has been remarkable. We also ask all students who visit us as part of a tour to fill out a short survey. Results won’t be tabulated until the close of the exhibition, but I feel the results will mirror the anecdotal evidence we’re seeing. As a curator, however, I’m always thinking about what we can improve upon – from the curatorial practice, to layout and installation, to printed collateral and programming…reflection is key. MB: I think the museum does an amazing job of allowing artists to ask difficult questions and explore relevant social and political issues. The Wignall Museum hosted workshops and discussion led by Mabel Negrete and the Counter Narratives Society. PP: Anything you’d like to add? RT: We hope that Inside/Outside and the many other excellent exhibitions and artists looking at incarceration with a critical perspective will encourage the questioning of the system as it is, and that it might even encourage engagement in our communities in ways that can make real change in the world. Follow the Wignall Museum at Chaffey College on Facebook and Twitter. Two of my fave up-and-coming photographers had a chat with one another. Zora J. Murff interviewed Isadora Kososfky, for Murff’s co-joint venture Strange Fire Collective. They’ve already an impressive archive of interviews with photographers. Murff was asking for the back story of Kosofky’s series Vinny and David. One of the many things the interview illuminates is the different attitudes toward images subjects and photographer may hold. It’s a good read, check it out. I wrote about Murff’s work for The Marshall Project, Tracked. I wrote about Kosofsky’s work for Vantage, Subjected To Prison, Defined by a Brother’s Love. Liz Pelly‘s conversation with Josh MacPhee in The Media is a wonderful read. It coincided with MacPhee and his cohort’s incredible exhibition of prisoner made protest materials going all the way back to the early seventies. MacPhee urges us to dismantle the idea that prisons are separate from outside society. Crucially, he’s not making, in the first instance, a moral point about how we’re all the same, prisoners and all. MacPhee makes an observation of the structural characteristics of the prison system. Of course, once the structural facts of the system are revealed, the moral point that we are all one-and-the-same, prisoners and all, is indisputable. I contacted Pelly and asked if I could republish the conversation. It originally appeared as Inside/Out: On Prison Justice, Art of the Incarcerated, and Interference Archive’s New Show in Issue #44 of The Media (October 10, 2014). It is a privilege to feature Pelly and MacPhee’s interview in full here on the blog. Between September 11th and November 16, 2014, Interference Archive exhibited, Self-Determination Inside/Out: Prison Movements Reshaping Society a look back at the visual and material culture of prisoner-led political movements. Organized by Molly Fair, Josh MacPhee, Anika Paris, Laura Whitehorn, and Ryan Wong, Self-Determination Inside/Out includes sections on the work of incarcerated AIDS educators, the experiences of women and queer prisoners, prison and control unit prisons. The exhibition features prison newsletters, pamphlets, video and audio interviews, prints, photography (!!!) and magazine covers — starting with materials created during the 1971 Attica Rebellion, a massive prisoner uprising in upstate New York, and concluding with work made by current political prisoners, the show highlights moments of self-organization within the prison industrial complex. You can buy a booklet and a poster for the exhibition. 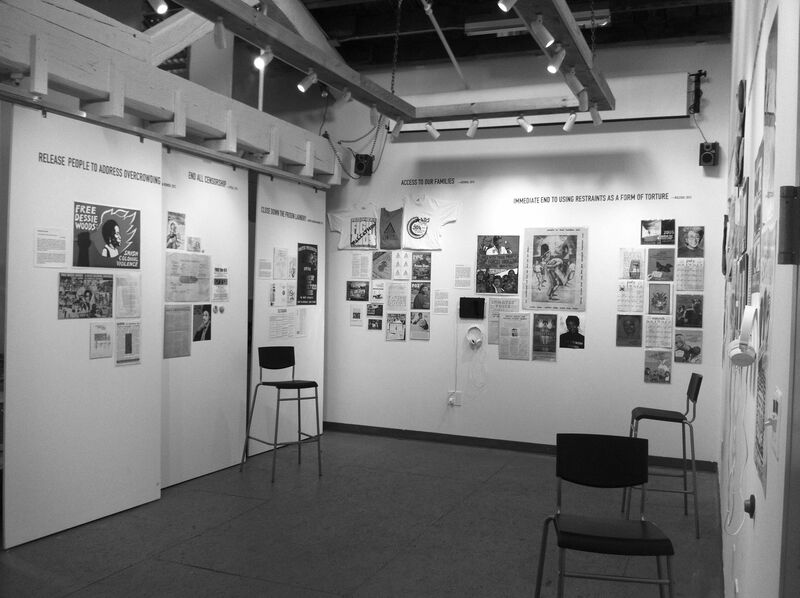 Interference Archive is a volunteer-run archive in Gowanus, Brooklyn, dedicated to preserving cultural ephemera related to social movements. Liz Pelly (LP): What initially inspired the creation of Interference Archive, which mostly houses ephemeral material like posters, t-shirts, and newsletters? Josh MacPhee (JM): For the different people involved, there are different answers of course. For me, I grew up making this stuff through DIY music, cultural stuff, politics. Through the act of doing, I started collecting it. Flyers, t-shirts, buttons, the ephemera that gets produced by people who are organizing. It was a combination of wanting to understand the history of what I was doing and then at the same time, I was getting really interested in this idea of how people make art and culture in the context of trying to their lives. It’s distinct from art that’s produced purely in the realm of self expression, and the art that tends circulate within the contemporary art world. This kind of material gets lost. It’s often not clearly authored. Institutions that deal with art don’t quite know what to do with it. Since it’s so political, places like history museums don’t know what to do with it either. It sort of falls through the cracks. But we can see during times like Occupy, or Tahrir Square in Egypt, or with the Maidan in the Ukraine, that this is the stuff of life, [created] when transformation starts to happen. When people have their arms shoulder deep into the constructions of representations of a new world, and the way they want things to be articulated. LP: That said, how do you think this sort of exhibit in particular shines light on the experiences of prisoners? JM: There were five of us who organized this exhibition, and most of us have been engaged with issues around prisons in different ways, whether having been formerly incarcerated, or working with prison activism programs. As far as I know, nothing like this has ever been done before. We live in a moment where over two million people are in prison. It’s getting harder and harder to hold up the pretense that prison is somehow distinct from the rest of society. When there’s this many people going in and out all of the time, there’s no way that our lives out here don’t leak into there, and that their lives in there don’t leak out into the rest of society. The idea that these are completely separate realms needs to be dismantled. We thought it was important to marshal primary source material to show that people aren’t just objects of repression or study or someone else’s activism. But they have done immense amounts of organizing inside themselves. Often times that organizing takes place at the same time, or sometimes even ahead of, what people were doing on the outside. Some of the focus we have on organizing around AIDS and AIDS education in prison was really fascinating and important because it shows how people that had the least access to medical care were doing in some cases the most organizing in order to try to deal with a problem that at the time the government was not even acknowledging existed. LP: Can you tell me more about your own experiences with prison reform activism? JM: I first learned about how the prison system functions in the early 1990s. It just sort of blew my mind that there was a whole world of people who largely because of race and class were basically being warehoused. And that, at the time, it was completely absent from the radar of public In the 90s, the only thing discussed in relationship to prisons and criminal justice was this sort of “tough on crime” thing. There was no acknowledgment that a massive increase of the prison population going on, and that it wasn’t actually working. And that the system that decided who went in and out was so manifestly unjust, random often. That sent me on a path of doing organizing around prison issues. I started in Ohio, and then did some work in Colorado, and then in Chicago. A lot of the organizing I did was around Control Unit Prisons, basically trying to stop solitary confinement. [Organizing around] these men and women who were spending twenty-three-and-a-half or twenty-four hours a day alone in their cells, and the psychological damage that causes and how it basically goes against international conventions of torture, yet it’s completely commonplace in this country. LP: Over the past year, there has been lot of in the news about the racist criminal justice system. It’s an apt time for Self-Determination Inside/Out: Prison Movements Reshaping Society. But obviously there is a lot of history of racism in the criminal justice system that this brings to light. Were you inspired to put this together because of recent events, or has this exhibit been in the works longer? JM: We worked on the exhibition for 6 months. As a space, as an institution, one of our goals is to take this material that’s perceived as marginal and present it in ways that will allow it to be in its own context, but also to actually show that it’s not marginal. Our primary audience is not people who already necessarily agree with everything that would be in this exhibition. We are conscious of, and trying to take advantage of, a moment. Mass incarceration accomplishes a number of things, none of which are its stated goals. It accomplishes deeply suppressing working class communities of color. That’s never been articulated as what the prison system is supposed to do. It’s just clear that that’s what it does. It clearly is completely ineffectual at actually dealing with crime. LP: What are some underreported sides to the prison industrial complex that you hope this exhibit brings to light? JM: The fastest growing portion of the prison population for years now has been women. Increasingly there is a real gendered aspect of being able to look at how the criminal justice system works. Increasingly it’s used to enforce gender binaries. It’s a brutal system for queer and trans people that get sucked up into it. People are doing a lot of organizing around it now, but until recently, it was assumed if you were gender non-conforming, they have to choose where to put you, and then once they chose a men or a women’s prison, then almost immediately you’d get sent to solitary confinement. You’d do your sentence out in solitary confinement, in complete isolation, because the system is not prepared to deal with gender non-conformity. You are being punished because your very existence challenges the bureaucratic way the system works. It’s really clear that women who refuse to be abused, who fight back against abusers, almost always get pulled into the criminal justice system. So we have things like Trayvon Martin being shot, and Zimmerman getting off. But any woman that stops an attack from an abuser is inevitably going to do time because that’s just absolutely taboo. LP: What were the biggest challenges to getting this exhibit together? JM: Each exhibition has unique challenges and obstacles, and then there are ones that are sort of similar across the board. For this exhibition, was just that cultural material produced by incarcerated people is hard to access. A lot of it is made in prison and then just never leaves prison. In general, one of the challenges for all of the exhibitions, is that unless we do something that’s very focused, inevitably there’s so much stuff it’s hard to know when to say “okay we’ve got enough” or to know when to draw the lines. It’s hard to know when to accept that you’re never going to have all of the stuff that you wish you could, that you’re never going to be able to tell the whole story, that maybe even the idea that you’re going to tell some sort of master narrative is questionable in its own right. When you’re representing things that are so deeply underrepresented, people get attached to wanting their part of the story told, because it’s been marginal or silenced for so long. It makes it really hard to make those choices, because you don’t want anyone else to continue to feel [that way]. We are collecting material from movements that are marginal. Even though they often have extremely deep impacts, rarely is that impact known or visible when they’re most active. It’s kind of like an extra kick in the face when your ideas become commonplace 10 or 20 years later and you’re still written out of the history even though you’re the ones who came up with the ideas. LP: What do you hope, in general, visitors learn from Self-Determination: Inside/Out? JM: On the one hand, I hope this contributes to a shift [towards] the idea that prisons are maybe not the answer to the problems that they claim to be. And that locking people in cages is not actually accomplishing what we’re being told it is. On another level, that incarcerated people are not just objects. They’re loved ones and family members and neighbors and community members. The thing that primarily defines someone as a human being is not whether or not they’re in prison. That people that happen to find themselves in prison, many for reasons that are and then also at the same time many for doing reprehensible things, doesn’t make them not human. It doesn’t mean they don’t have the same desires, life goals, and relationships that everyone else has. And as such, the way that they conceive themselves and their world is part of, needs to be part of, any movement for social transformation. (2 blocks from F/G/R trains at 4th Ave/9th Street). Josh MacPhee is an artist, curator and activist living in Brooklyn, NY. MacPhee is one of the founder of the Just Seeds Artists’ Cooperative, which organizes, creates and distributes radical art. MacPhee is the author of Stencil Pirates: A Global Study of the Street Stencil, which is dedicated to stencil street art. He co-edited Realizing the Impossible: Art Against Authority, Reproduce and Revolt and the upcoming Paper Politics: Socially Engaged Printmaking Today. In 2001 he co-organized the Department of Space and Land Reclamation in Chicago with Emily Forman and Nato Thompson. In 2008 he co-curated the exhibition Signs of Change: Social Movement Cultures 1960’s to Now with Dara Greenwald. Liz Pelly is a freelance writer and editor based in Brooklyn, NY. I lives and works at the all-ages collectively-run art space The Silent Barn, where she books (and sometimes plays) shows. She and her friends run the ad-free bi-weekly online newspaper The Media.